Set "Horizontal Anchor" to "Center"
Set "Vertical Anchor" to "Middle"
Set "Text" to "Historic data of what went wrong"
Set "TargetWindow" to "Modal Popup"
Set "Label" to "Selected Reason (numeric value)"
Set "Prompt" to "Set this box to 'true' to trigger the popup. Set the value via the Thing to simulate a service. Once the value is set, the trigger is set to 'false' as the popup has been dealt with. A new historic entry will be created." This will determine if the checkbox (based on the trigger / error state) is true or false. If the checkbox switches to true then the validator will call the Navigate service on the Navigation Widget. Otherwise it will do nothing. 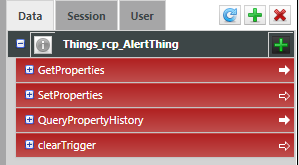 Set the "Column Title" to "Reason for Outage"
Set "Dependent Field" to "selectedReason"
Set "State Definition" to "rcp_AlertStateDefinition"